Alas, the books in the Sock Monkey series – Sock Monkey Goes to Hollywood, Sock Monkey Boogie Woogie, and Sock Monkey Rides Again – are hard to find. All published by Candlewick Press, they are currently “out of stock indefinitely.” Maybe together, we can get them reprinted some day. If you’re interested in that prospect, contact Candlewick Press and let them know how you feel by writing to bigbear@candlewick.com. Remember what Horton says in Dr Seuss’s masterpiece, Horton Hears a Who: “Every voice counts!” And maybe, just maybe, if the books ever get reprinted, I will finally get to publish a holiday Sock Monkey book, which is currently sitting in my Enormous Cabinet of Rejected Books. It combines the first two books (Hollywood and Boogie Woogie) into one lovely book. 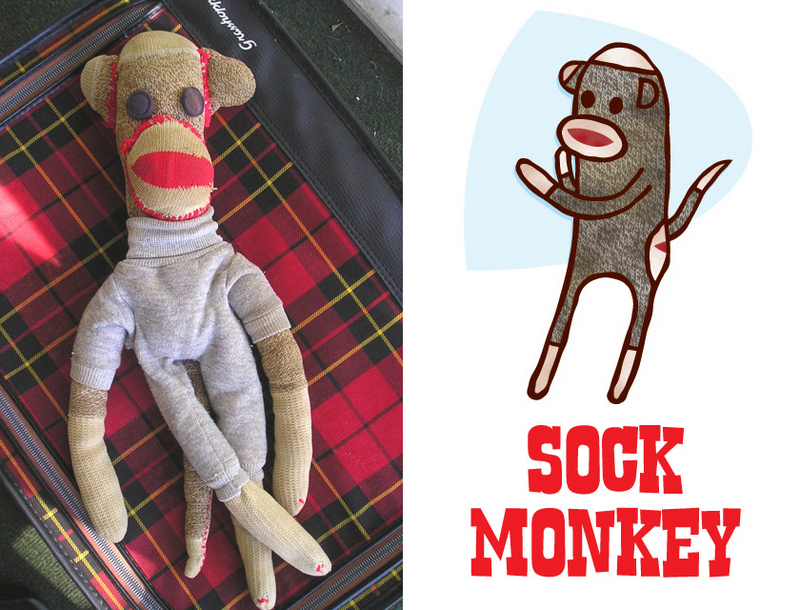 All three books were inspired by my actual Sock Monkey, which I made way back in 1995 from a kit that my grandmother gave me. I fell in love with that monkey instantly, and the stories followed after. It's the real Sock Monkey! The other characters in the books are real, too. Really! Truly! 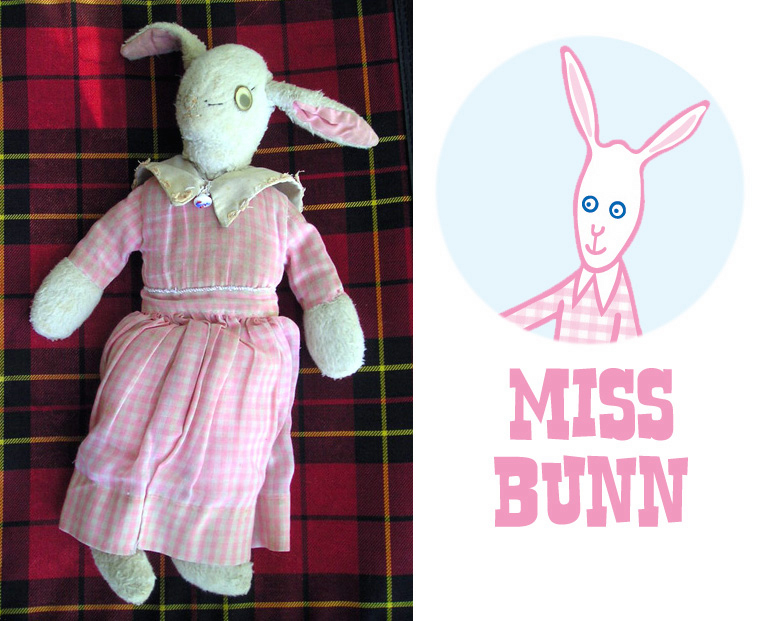 Here’s Miss Bunn, made by that same grandmother, back in 1975. Miss Bunn! So sweet, just like my Granny Bell, who made her. And Blue Pig, who belongs to my older sister, and was purchased by her at a People’s Drug Store in Richmond, Virginia, in 1972. Blue Pig, wearing a skirt? What the what? Note that Blue Pig did not wear a skirt back in the old days. 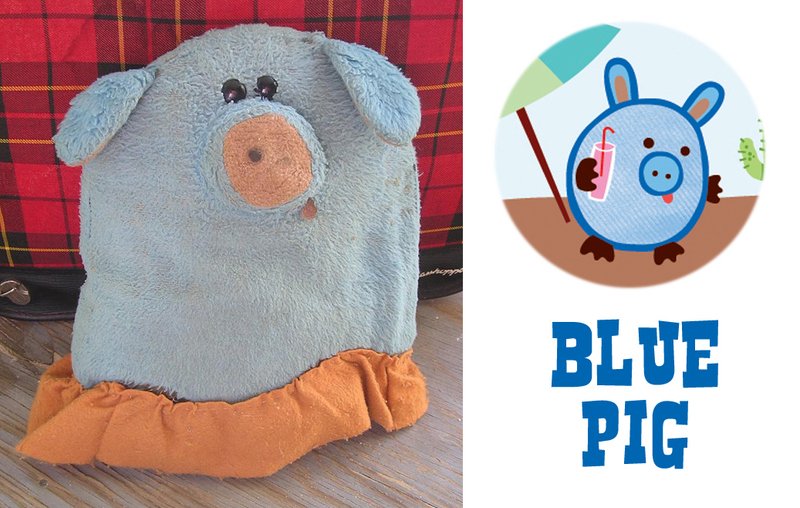 My mother, bless her, tried to fix Blue Pig’s bottom (which had fallen out – imagine that happening to your own bottom!). She (my mother, not the bottom) was not happy with her sewing, so she covered it up with a skirt made of felt. Voila! A fashion icon was born. 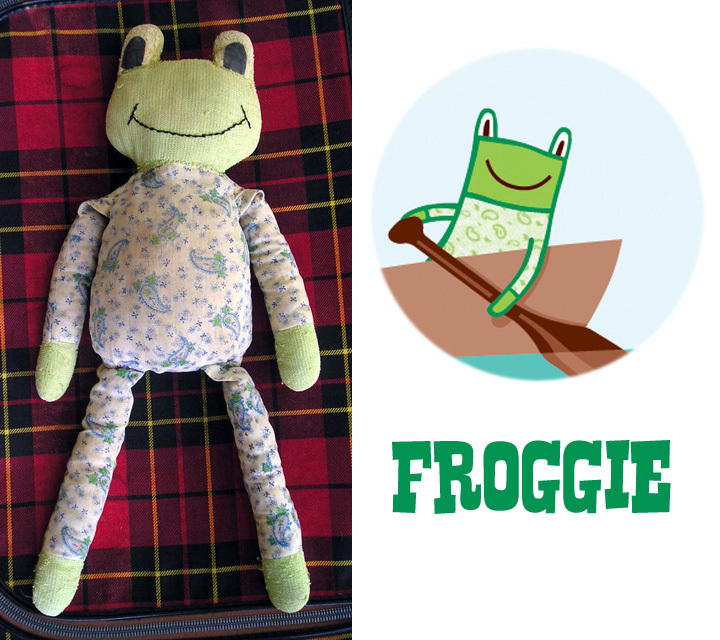 Froggie was made by my mother-in-law in 1970, for the amazing baby who grew up to be Tom Angleberger, the amazing author of the Origami Yoda series. Froggie -- green and gorgeous, just like his owner. And here’s Sock Buddy, who mysteriously appeared during a trip to New York City. The illustrations for these books were done using Freehand on a Mac. Remember Freehand? I drew everything first in pencil, scanned in those drawings, and then used those drawings as guides for the Freehand stuff. I also scanned in fabrics and socks so that I could create the textures for each character. 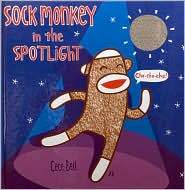 Sock Monkey Goes to Hollywood received an Oppenheim Toy Portfolio Gold Seal Award, and was named “Quirkiest Picture Book” by Publishers Weekly in 2003. And if you want to know more about sock monkeys, and Sock Monkey, check out Sock Monkey 101.
hi i’m Megan i am a fan of Tom Angleberger’s books and i saw a link to your site on his site and i read the sock monkey series and i just wanted to say good books! Thanks so much, Megan! Glad you like the books. And Tom’s books, too. Rock on! Hi Heidi! Thank you so much for your note! BeeWigged is my favorite, too, I have to admit. I’m always glad to hear that it’s someone else’s favorite, too. If you don’t have Itty Bitty and Rabbit & Robot, those are a couple of the books I’ve done since BeeWigged. Also, I illustrated the book Crankee Doodle with my husband, Tom Angleberger. You might like that! Same silly sense of humor. It’s so neat to have a fan all the way in Australia! Hope your visit to the US is a lot of fun. Best to you! ESPECIALLY for a 12 year old! My son and I just found one of your Sock Monkey books at the local library and have fallen in love with the characters! We can’t wait to read all the books in this series. We hope that you will continue to add more books to the series and wish you continued success. 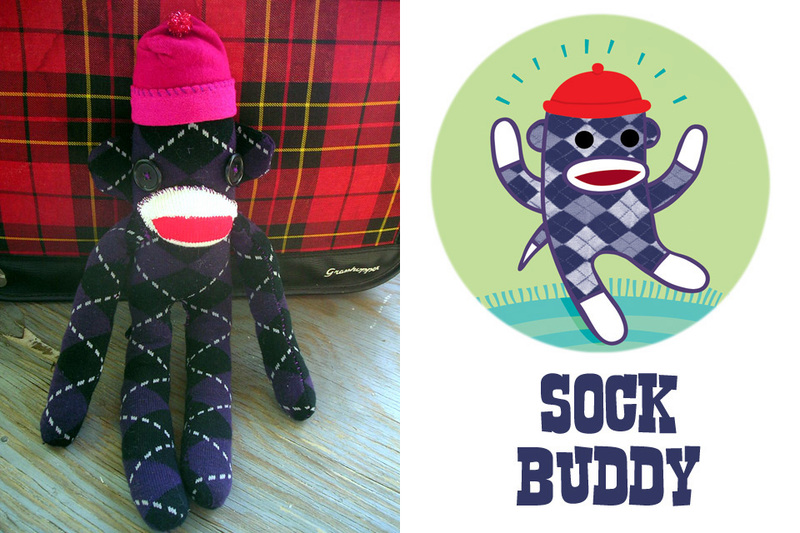 Thank you so much for your kind words about the Sock Monkey series! I have some great news about those books. They are going to be reissued by Candlewick Press, and I’m even working on a fourth book in the series. So…you and your son can look forward to more weirdness from me in the future! Thanks so much for reading the books! Woo hooo!!! Congrats on the re-issue and we are soooo excited for the fourth book. Thanks for responding to our comment. Such a wonderful treat. You bet! A very happy Independence Day to you and your family. Yay for a new sock monkey book! Thank you, Sue! I’m a bit daunted by it. I want to make it EPIC!!! Awwww, thank you! SM loves you! Cece, have you wrote a speech before? If so, I need some tips on speech writing.